Sometime a trailer comes along and it just works. 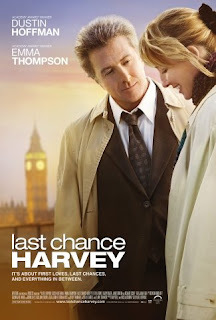 Take the case of Last Chance Harvey, starring Dustin Hoffman and Emma Thompson. It starts simple. A couple quick cuts and we meet Harvey, frumpled and fumbling. Soon the song comes in and we're in rom-com movie montage heaven. Who needs 2 and half hours? I've seen all I need to in 2 minutes and 20 seconds.